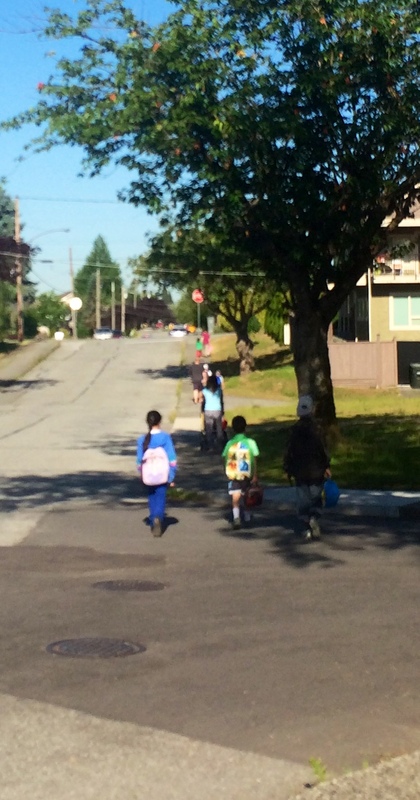 There is a parade of kids walking to school here in Burnaby – the city next to Vancouver on the Lower Mainland, where we live. This astonishes me. The kids are as young as five, some walking with an older sibling, and the vast majority of kids in grades 4 and up are walking to school without their parents. Some are on bikes, others on skateboards or scooters. For Aaron and his bad knee, the 17 minute walk to school is quite the hike for him. But we’ve been walking home after school on my days off, and this morning, we agreed to head out by foot at 8:30 am. I remember our beloved pediatrician, a long time ago, talking about kids with Down syndrome and weight. ‘Forget about diets.’ she said. ‘Keep your kids active instead.’ That’s been our motto since our move here, and Aaron is slowly starting to embrace it. We try to walk as a natural part of our day – I park far away and we walk to our destination, or he accompanies me reluctantly (it helps if there are sticks available to him) to the mailbox or grocery store. But he’s moving a heck of a lot more than he ever has in his life. The mild weather helps. As does the predisposition of Vancouver-types to burst outside whenever it isn’t raining. When we lived in a much harsher climate in Edmonton, motivating Aaron to get outside 7 months of the year was a hard sell. He didn’t like the cold (and neither did I) and he was terrified of falling on the ice. His bad knee precluded him from skiing, and we were stuck being aimless shopping mall walkers for most of the year. We did live across the street from Aaron’s school in Edmonton. He walked to school every day (a slow 5 minute walk for him) – first with one of us, and then gradually by himself, after we accompanied him across the busy street. The irony is that those 90% of people were the ones who contributed to the dangerous traffic. I asked the school and the city repeatedly for patrols or traffic signs to be placed at the busiest intersection. ‘Too dangerous’ they said. Too dangerous for adult patrols, but not too dangerous for the little kids who dared venture to school on foot. The other barrier to walking to school in Edmonton is the death of the neighbourhood school. So many parents choose or are mandated to drive their kids across the city to schools for special academic or sports programs. In Burnaby, they’ve kept the small local school model. All kids who live in the neighbourhood go to their local schools. The catchment areas are all small – less than 6 blocks around the school – and so all kids are within walking distance to the school. Here, all the Burnaby schools have 30 km/hour school zones which are monitored by the RCMP. People truly respect that speed limit and slow down accordingly. Adult pa trollers are positioned at the busiest intersections. A lady, Miss Sheila, is near our school every morning and every afternoon, and she walks out right onto the road with her stop sign to make sure the kids get across ok. This means we no longer have to play a pedestrian version of Frogger when we cross the road. Here’s to promoting communities and schools that enable kids to walk back and forth to school. Besides encouraging activity, the walk allows opportunity for Aaron to interact with his classmates walking home and to chat with me about his day. Today he gleefully played the age old, ‘step on mom’s shadow’ game. By the time he reached our front door, he was relaxed and happy. Kids walking to school. Win, win, win for everyone. Sue, Van is very much a more walkable city (I lived in various neighbourhoods over 15 years). Your comments about The loss of neighbourhood schools in Edmonton are right on. Many things lost with this, namely building a community and positive social networks with neighbour’s beyond next door.